WalkNYC is a new program of pedestrian maps that makes it easier to navigate New York City streets. The kiosks present two maps, one of local streets and the other of the area’s location in relation to a larger section of the city. Orientation of maps use “heads-up” mapping, in which north, south, east or west is rotated to correspond with the direction the user is facing. 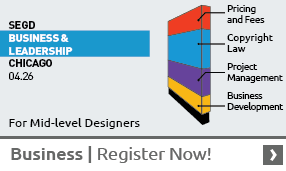 The design was extensively tested and found easy to use. Map detail. A variety of information is layered into the map, including icons of landmarks. Subways are indicated by tabs that resemble station signs. 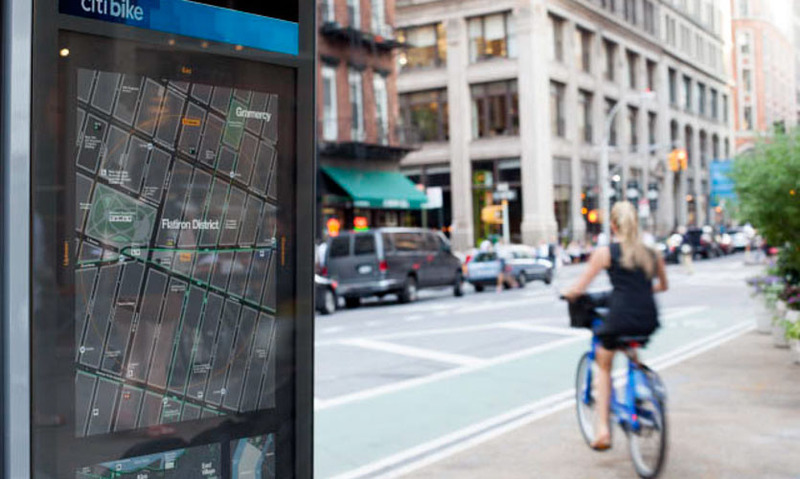 The maps are installed on the new CitiBike bike-sharing kiosks. 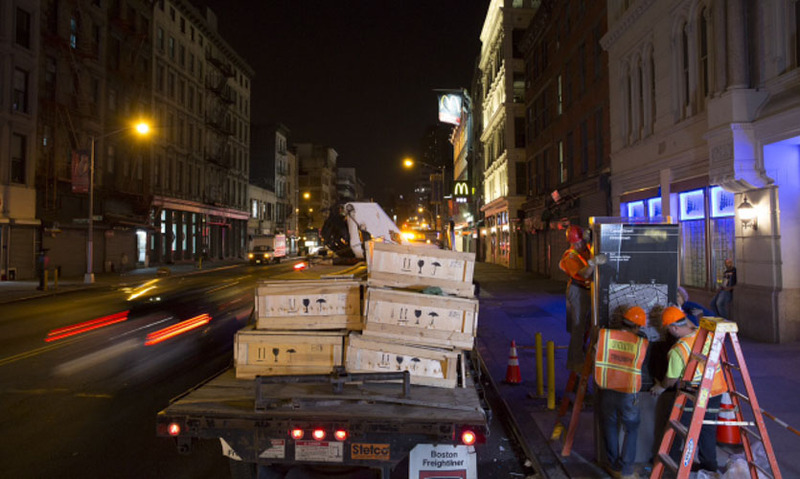 Map kiosks being installed in Chinatown. Finding one’s way through the streets of New York when coming up out of the subway or walking through an unfamiliar neighborhood can be confusing, even for the most seasoned New Yorker. 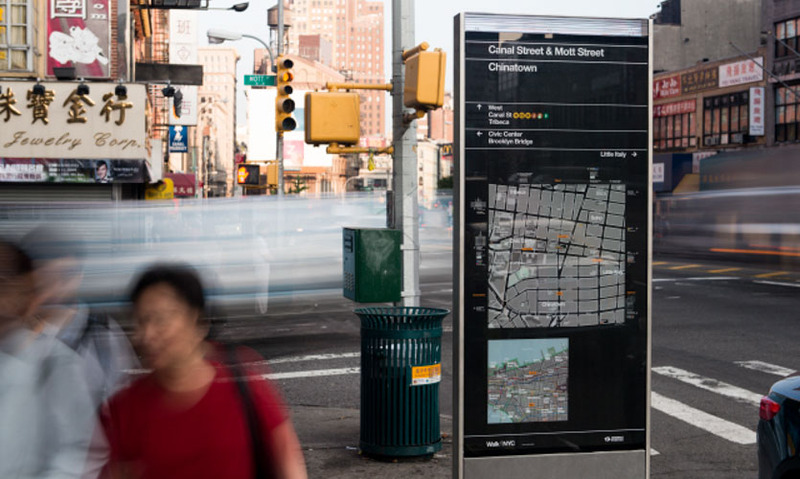 WalkNYC is a new program of pedestrian maps that makes it easier for New York’s 8.5 million residents and 50 million yearly visitors to navigate the city streets. 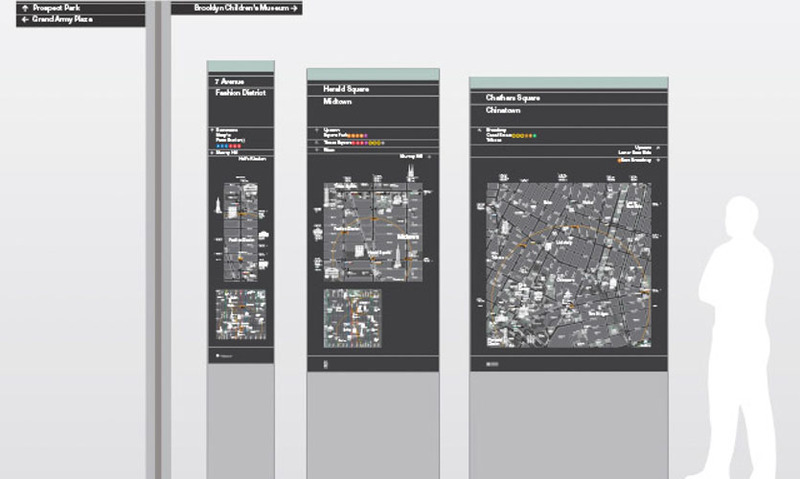 The maps were developed by a special consortium of designers, including wayfinding specialists, graphic designers, industrial designers, urban planners and geographic information specialists, called PentaCityGroup, who worked in close collaboration with the New York City Department of Transportation, the city’s local Business Improvement Districts (BIDs) and other agencies. 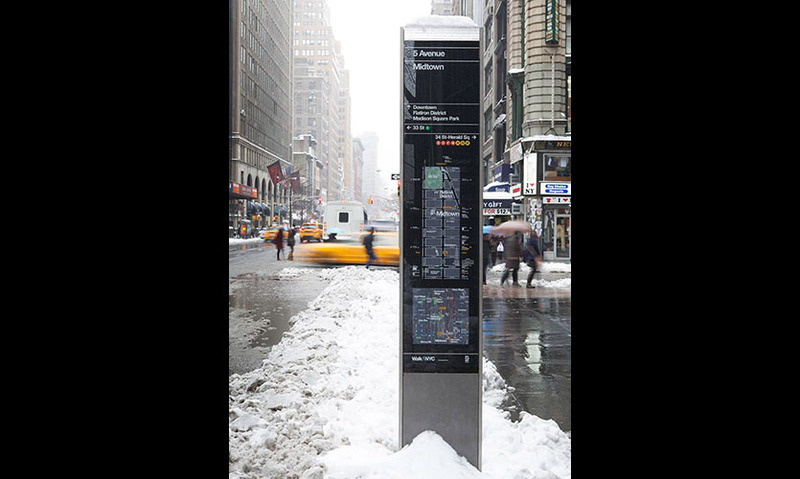 Placed on a system of dedicated kiosks throughout the city, the maps are designed to encourage people to walk, bike and use public transit, and to help guide them to major landmarks and destinations, as well as subway, bus and bicycle-share stations. 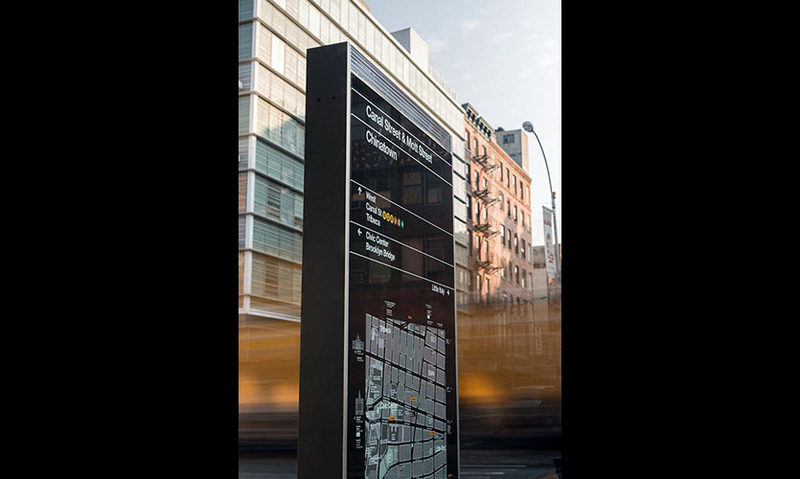 Each side of the 8.5-ft.- tall kiosks displays a large map of the streets within a 5-minute walking distance and another map showing the area in relation to a larger section of the city. The maps use an innovative “heads-up” orientation, in which the compass direction (north, south, east or west) is rotated to correspond with the direction the user is facing. The information and design were extensively tested with pedestrians, who found it easy to use. 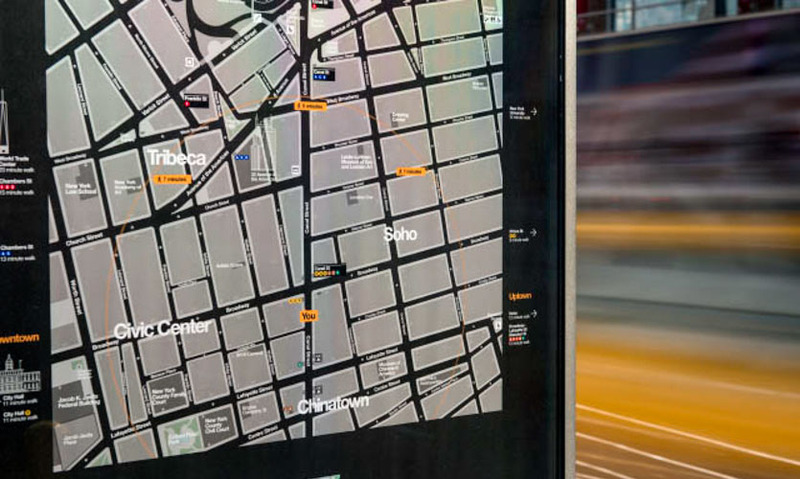 The graphic language of the maps utilizes a customized version of Helvetica, chosen to complement the iconic graphic language of the New York City subway system and to create a seamless dissemination of information above and below ground. 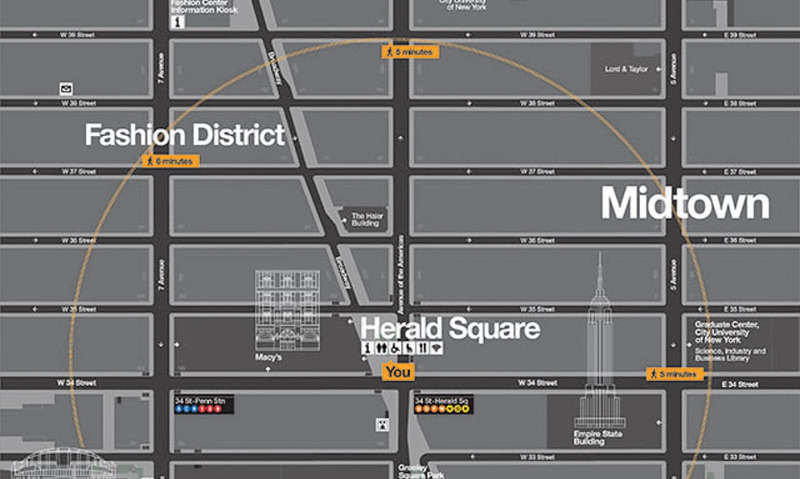 WalkNYC’s customized version, called Helvetica DOT, makes all of the font’s square dots round, giving the program its own unique look. To create a common visual language throughout the program, a set of 60 pictograms was designed, each drawn to match specific characteristics of Helvetica DOT. The maps also feature iconic New York landmarks, like the Empire State Building and One World Trade Center, rendered as detailed, evocative line drawings. The program’s palette is inspired by the colors of the city: the yellow crosswalk lights, green parks and bike lanes, white crosswalks and gray streets and sidewalks. This design has also been applied to WalkNYC’s graphic identity. The logo appears at the bottom of the new signs and is used to endorse any maps that use the graphic language of the program as “official” city maps. City agencies and BIDs can utilize the mapping system in their own communications, and they have the ability to add their own data layers to their printed maps. Since the first phase of the program was implemented in Midtown Manhattan, Prospect Heights in Brooklyn and Long Island City in Queens during the summer of 2013, WalkNYC has been extended to Select Bus Service signs, printed tourist maps and MTA Subway stations all over the city and its neighboring boroughs—creating a truly unified navigation system for New Yorkers and visitors alike. "A prototype setting a future language for all global cities. Informed travellers activate sidewalks and reinvigorate neighborhoods."